This easy chicken wonton recipe reduces the fat and calories by baking instead of deep-frying the filled wontons. It also uses reduced fat peanut butter and a sugar substitute. If you are having a party, your guests who are watching their waistlines can enjoy a wonton appetizer. These wontons are flavorful in themselves. You can also serve them with a dipping sauce such as soy sauce, sweet chili sauce, ketchup, cocktail sauce, or spicy Chinese mustard. Preheat the oven to 350 F. Spray two 9-by-13-inch baking sheets with non-stick cooking spray (such as Pam). Heat the wok over medium-high to high heat. Add 2 tablespoons of oil, drizzling it down the sides of the wok. When the oil is hot, add the shallots, garlic, and green onion. Stir-fry briefly then add the chicken meat and stir-fry on high heat until the chicken changes color and is nearly cooked through. Stir in the remaining ingredients (peanut butter, shredded carrots, green curry paste, soy sauce, sugar substitute, and lime juice). Remove the wok from the burner, and allow the mixture to cool. Set out the wonton wrappers with a small bowl filled with water. Lay out one wonton wrapper, and place approximately 1 tablespoon of the chicken mixture in the middle. Dip your finger in the water, and run it along the edges of the wonton wrapper to wet it. Take another wonton wrapper, and place it on top in a way that forms a star shape (ie. the top wrapper looks like a diamond instead of a square). Fold the star points from the bottom wonton over the top. Fold the star points from the top wonton under the bottom. Now you should have little packets. Continue with the rest of the mixture and wontons. To cook the wonton, lay them out on the baking sheets and spray lightly with cooking spray. Bake for 12 to 15 minutes until golden, turning halfway through cooking. 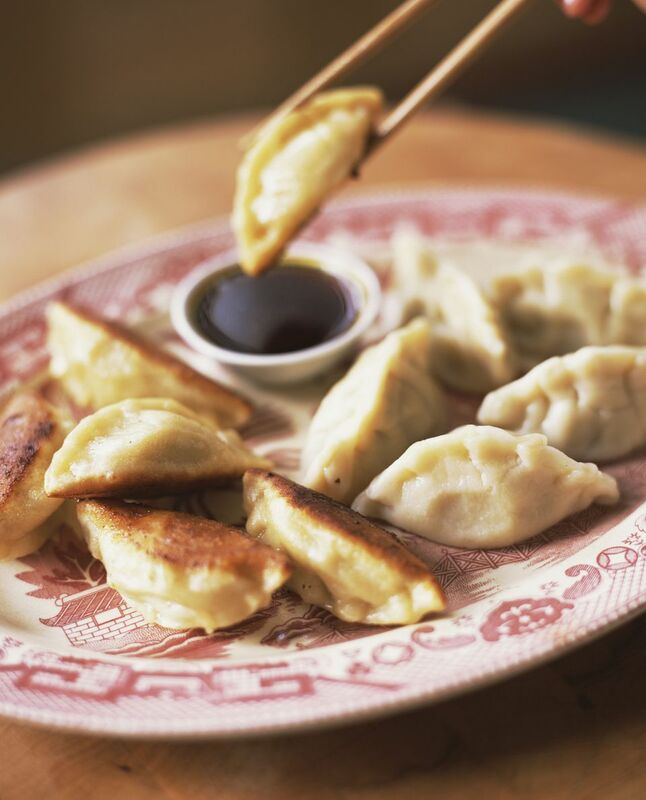 Serve the hot wontons with a dipping sauce as an appetizer or part of a dim sum meal. You can make the wontons ahead of time and freeze them. Place them on a baking sheet in a single layer in the freezer until frozen then transfer them to a freezer bag or storage container. Let thaw before baking or deep-frying. Note that deep-frying will add more calories due to the oil.